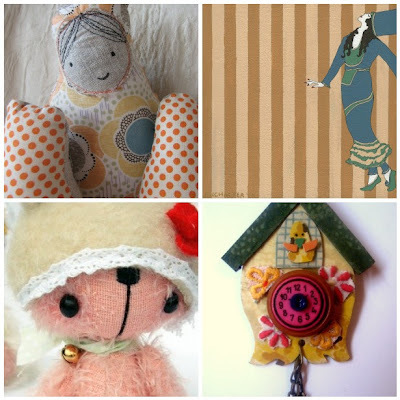 clockwise from top left: Mrs Summer Drops from tsktsk; Farewell Kabarista Original Painting from Octavine Illustration; Bear Postcard from Jennylovesbenny; Kooky Time Cockoo Clock Brooch from Betty Jo Designs. For more shopping lists go visit Charlotte at fancypicnic. love the soft doll up there!!!! Nice shopping list. I love Betty Jo's goodies so much. Thanks for the link to Fancy Picnic too. great to have you back with your lists! tsktsk's is gorgeous! i've only just discovered bettyjo. Marvellous!